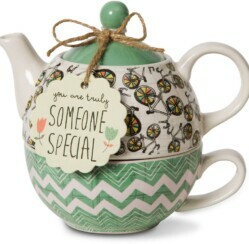 Home » Blog » Tea Pot Giveaway Contest! My favorite gift would be the Nespresso Vertuoline EVOLUO. I would love to be able to make fancy coffee shop drinks at home. It would make every morning special. My favorite Christmas gift on Christmas.gifts.com is the Angel with the dove. I like the Assorted Chocolate Dipped Pretzels! They look so good!! I shared on Twitter also! I love so many things on your site but one of my favorites is the black hills gold silver cross necklace!! It was a hard pick for sure! I love the black Hills gold silver cross necklace as one of my favorites on Christmas gifts.com. They have many nice items and it was very hard to choose a favorite!! The dinner of the month club sounds fun! Ok I love the Godiva Chocolate basket! It has so many things in it that i have never tried so I would enjoy the samplings so much! !